Nowadays, the chemical industry is under increased pressure to develop cleaner production processes and technologies. Much effort is devoted to the development of heterogeneous catalysts and their application in industrial-scale organic synthesis. This handbook concentrates on current attempts, focusing on fine chemical production. With contributions from an impressive array of international experts, this is essential reading for everyone interested in the advances in this field. Roger Arthur Sheldon FRS FRSC is Emeritus Professor of Biocatalysis and Organic Chemistry at Delft University of Technology in the Netherlands. 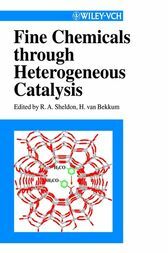 Herman van Bekkum is the editor of Fine Chemicals through Heterogeneous Catalysis, published by Wiley.